Thrill in the discovery of Dunedin’s fabulous visual arts. Always changing. Always evolving. 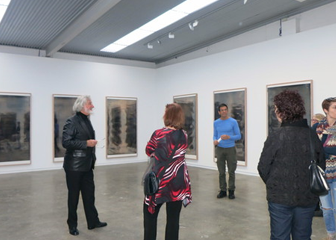 Along with the literary art and music scene, Dunedin has developed a great fine visual arts sector. There is a significant collection of fine art galleries, ever changing exhibitions of emerging, mid-career and established artists, reflecting the creativity found in the Southern climes. 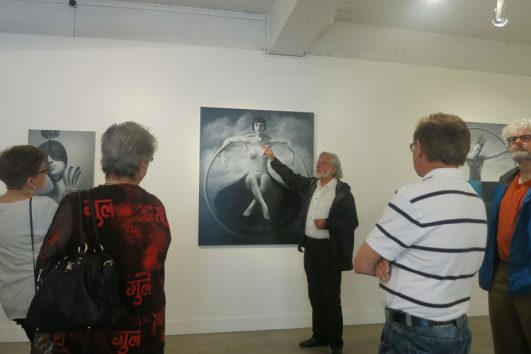 Fourth Saturdays, the Dunedin Walk and Talk an Art Precinct is a guided gallery walking tour, to one of two totally different cluster of galleries. 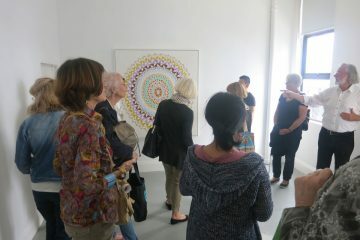 We are introduced to the gallery, gallerist, the exhibition and sometime we are lucky to get to talk with an artist. We get all the extras of being with a person the gallerists know and respect. As the exhibitions are constantly changing, no walk is the same. Repeat the Walks and you will find new exhibitions and always have a most interesting and informed experience, deepening and extending your knowledge of the art in the exhibitions. After the Walk we always find a good place to invite you for coffee and more talking. Our guide is James Dignan. James is well known as a long time contributor to the ODT (Otago Daily Times) Art Seen Column. He brings a depth of knowledge, especially of the local art scene. BOOKING DETAILS We would love to receive your booking online through the box on your right. Alternatively you can email us: info@artexplore.co.nz OR phone: 0211883933 and just turn up. Bookings are confirmed on payment. Come along and pay in person by cash (exact change please). Ask about our Discount Card to receive every 5th walk free. This first Walk & Talk was fabulous with 22 people! Everyone loved it. A wide variety of art and superb comment from Jennifer Hopkinson. The second Walk &Talk with James Dignan with 17 people included an artists talk, studio visit and in depth commentary from James. Superb. What a treat! Expert commentary from Jennifer Hopkinson, on a variety of artworks, made this a thoroughly enjoyable, informative and accessible way to experience the showcased art. Having two of the featured artists in gallery to share their exhibitions in person was the icing on the cake. Thank you to Jennifer, Catherine and Art Explore. I’d recommend your tour as worthwhile for anyone with any interest in art, whether they be expert or novice. Thanks for a very enjoyable time. I’ll be coming again. We had a lovely tour by Jennifer, met 3 artists, Inge Doesburg, Peter Cleverley from Oamaru and John Z Robinson. 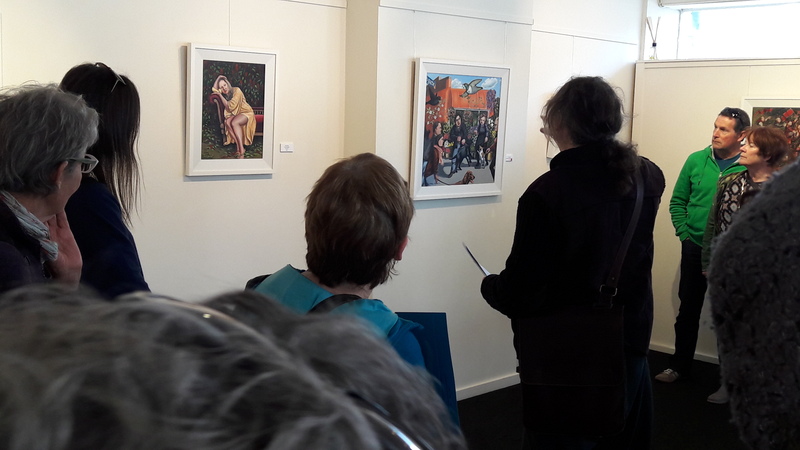 There was a spare 5 minutes at the end of the tour so Jennifer had the inspired idea to take us to the foyer of the Railway Station, which was the scene of one of the portraits at DPAG where the artist is barely visible walking quickly across to the platform.